Sweet Sentiment: Sweet little monsters! 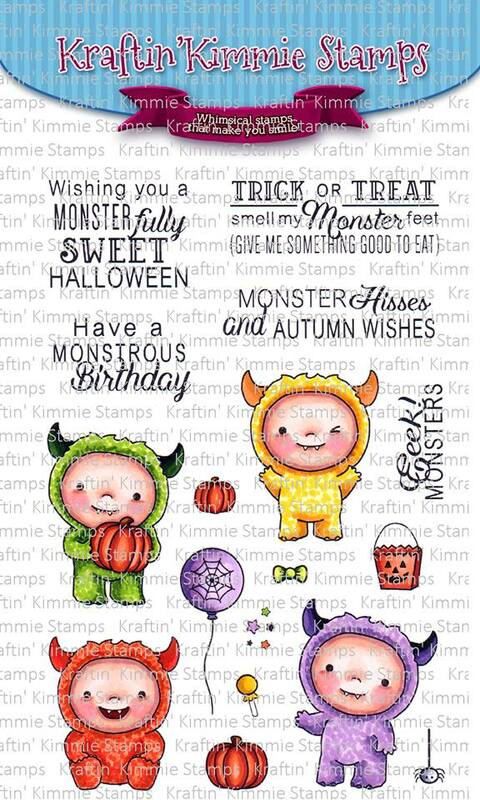 Welcome to Day THREE of ourSeptember Krafty Peeks at Kraftin' Kimmie Stamps! We've got a super sweet stamp set to share with you today! This one is from artist Becky Pearce and it's called MINI MONSTERS! These chubby little kiddos are dressed up and having fun as MONSTERS!!! They are ready for some spooky fun! The set comes with several main images, lots of cute accessory stamps and five fabby sentiment stamps for a total of SEVENTEEN stamps in the set! It's also challenge day and our hostess is Krafty Girl, Tangii! And as always during release week, the challenge is ANYTHING GOES! So create a card, scrapbook page or altered item with any stamp but if you use a Kraftin' Kimmie stamp you'll double your chances to WIN!! Use any sketch, any design, any embellishments because Anything Goes! Have some krafty fun and join us this week because we'd LOVE to see your KKS designs. You have a week to play with this challenge and at the end of the month, we'll announce a WINNER from all of the weekly challenges for September! We hope you can play along for your chance to WIN a $20 Gift Certificate to use on ANYTHING you want in the shop!! Wanna win?? Here's my "card" using these silly little monsters! I mad a 3D box card that folds flat so you can mail it! 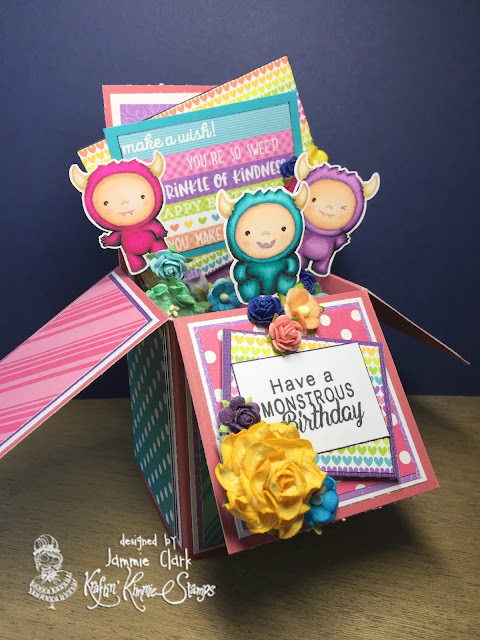 You'll see the new stamps in action and featured in today's blog hop with the Krafty Krew and Guests!! Their links are below and be sure to leave some love at each stop because one lucky stamper from all the comments this week is going to WIN a gift voucher to go shoppin'! ALL of our new September stamps will be available this afternoon at the Kraftin' Kimmie Stamps Shop!!! Be sure to join us on facebook for an hour of celebrating the new stamp sets, fun and prizes today at 2pm EST at our LIVE ONLINE RELEASE PARTY!! Tootles! Wow thats such an awesome project its so super cute, love it! Fantastic pop up card! Super cute. I love this box full of cuties! I think I will get this stamp set because the little monsters look about the same age as my grandson! This is such a cute and fun box ! !